My Suitcase Can Only Weigh HOW MANY Pounds?! 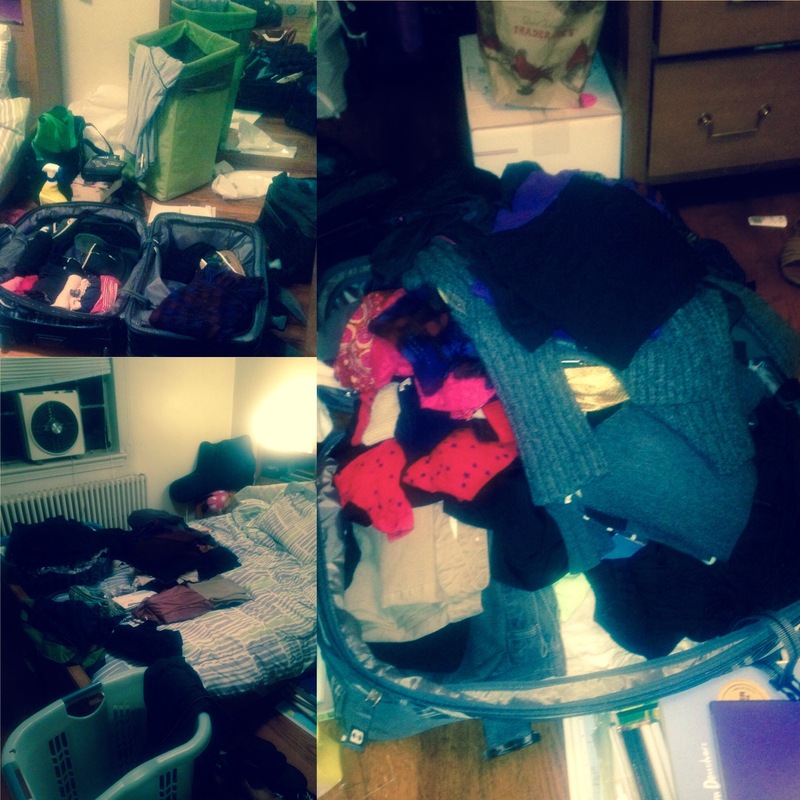 And other packing concerns. I’ve gotten a few questions recently about packing for TAPIF. Figuring out what to bring for seven months, in a strange country, for a professional job, which takes place over mostly winter-y months, all while keeping in mind airline limits is not a simple task. My number one recommendation is: make sure you can carry what you pack. You’ll inevitably have to lug your luggage through the airport, onto a train, through a metro system, across cobblestones and up 5 flights of stairs, and while passersby are generally kind to someone in need of an extra hand, you’ll be much more confident if you know you can at least manage it on your own if no one is around to help. After that, what you bring and what you leave behind is more or less your prerogative, but here are some of the guidelines I used. 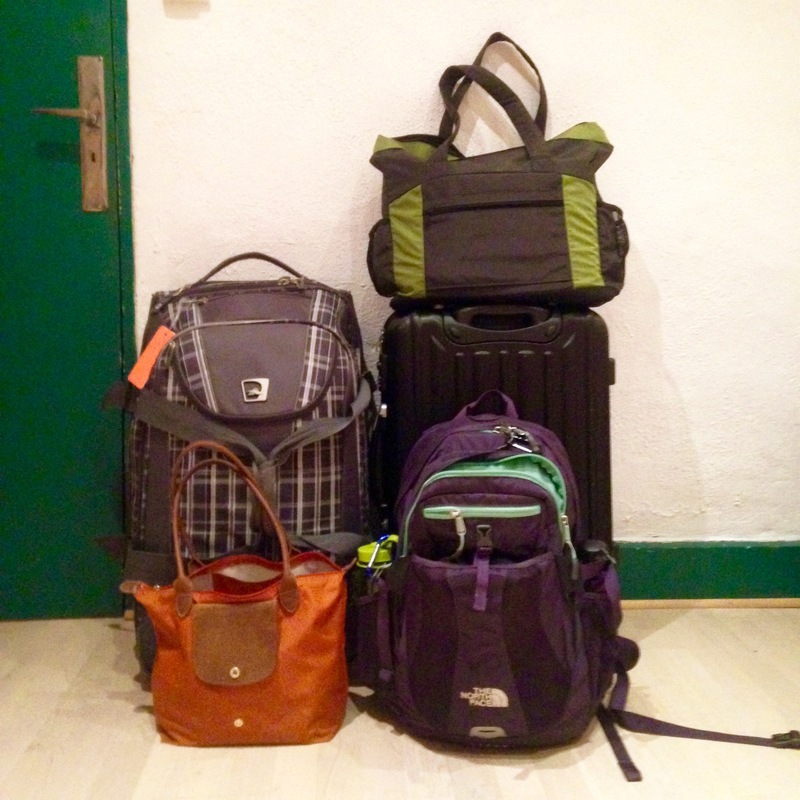 I arrived in France with a 49.9 pound suitcase, a regular backpack, and a large tote bag. Clothes: Pack your favorite selection of versatile t-shirts, sweaters, dresses, pants, skirts, sweatshirts. Pack what you already know you will wear. Don’t pack that trendy top you bought on a whim if you think you’ll only wear it once or twice. Yes, there are things I left behind that I wished in retrospect I had brought, but I’m the kind of person who has the same shirt in 8 different colors anyway, so it would be a waste of space to pack the other stuff! Dress code for teachers is casual: probably what you wore to class in college will suffice (unless you wore yoga pants and pajamas to class…we’ve all been there. But I don’t recommend that for teaching). Also made sure to pack approximately one week of clothes in your carryon just in case of a luggage delay, and so you don’t have to unpack everything right away. This is especially nice if you’re staying in a hostel or AirBnb for a few nights and don’t really have the space to sift through 50 pounds of luggage right away. Shoes and Outerwear: Because I knew I’d be in the mountains, I brought my snow boots, along with two pairs of sneakers (keds and converse), flats, and running shoes. I brought my raincoat and a light windbreaker, though I left behind my winter coat because I needed a new one anyway, and planned to buy one there. Toiletries: If you have specific hair products or makeup that you can’t live without, bring them because you may not find the same brands. I don’t, so I just brought travel size stuff (as well as a month or so of feminine hygiene products) to hold me over until I could hit up Monoprix. School Stuff: I packed a laminated US and World map which was an awesome tool I used in almost all my classes. I brought a big collection of picture books, TONS of stickers, and some photos and postcards showing my hometown. Fun Stuff: Don’t forget to bring chargers and accessories for your electronics. And I’d recommend bringing at least 2 plug adapters. I brought my laptop and invested in a Kindle (controversial for many book-lovers, I know, but honestly I think it was one of my best purchases and even now being back in the land of English language book abundance, I am constantly reaching for my Kindle). I brought a fairly large collection of scarves because it is difficult for me to leave the house if I’m not wearing one, but I brought almost no other accessories. Documents: Of course make sure you bring your documents and some copies with you! It’s probably a good idea to spread the copies over multiple bags so you don’t lose everything with one lost backpack (and to make it harder for someone to steal your identity, god forbid!). I made photocopies of my credit and debit cards, my driver’s license, my American health provider card, US social security card, passport ID page and visa, arrêté de nomination, and my birth certificate and apostille. If you’re uncomfortable carrying copies of so much personal data, you can opt to save scanned copies on a sacredly-held flash drive instead. I also left a folder with my parents of copies of everything plus a check and deposit slip for my checking account, just in case. Clothing: Yes, of course I did some shopping during les soldes, but the only clothing item I planned on buying in France was a winter coat. I needed a new one, and didn’t have room in my suitcase anyway. Toiletries: Don’t bother bringing your blow dyers, hair straighteners, or curling irons. Because of the voltage conversion, they most likely won’t work in France. If it is something you use on a regular basis, as I do, just buy a cheap replacement. I also ended up buying another suitcase for my return trip… When I arrived I had next to no space in my luggage for any souvenirs, and after 8 months of accumulating stuff, I needed an overflow space. Don’t be concerned about being chic and French and fancy…there will be nights in where you’ll wish you had brought your favorite sweatpants and college sweatshirt. One more pair of casual shoes. Bringing my converse was a great idea (they’re quite popular in France!) but I wish I had had one more pair of casual shoes as I nearly wore out the two I did have with overuse. At least one non-children’s book…I had my kindle so reading books in English was no problem, but every now and then I wished I’d had a cherished copy of my favorite book to take out to the park or the café. P.S. Great story about the image in the header. I did a Google search looking for stock photos of a shampoo aisle, thinking the colorful toiletries would be a nice image. One of the first dozen hits was this photo, which I instantly recognized as being by French artist Denis Darzacq. I spent a few weeks translating his artist statements and writing an exhibition proposal for Galerie RX, the gallery that represents him in Paris, when I worked there as an intern!!! More of his work can be found on their website. Anne, as someone who has done TAPIF twice and who also has more sweatpants than any other type of pants combined, I really appreciated your helpful hint to bring more sweat pants. Perhaps you were inspired by my daring and fashion forward red sweatpants which spawned a movement, and became the inspiration for my Sims signature look. Also I’m wearing pajamas right now. Ooh do you think I should add that photo to this post, so people get a sense of the possible outfit options?? Thanks for the great outline! I leave in a week and am having a hard time condensing everything. Previous PostLadies and Gentlemen, An Announcement!